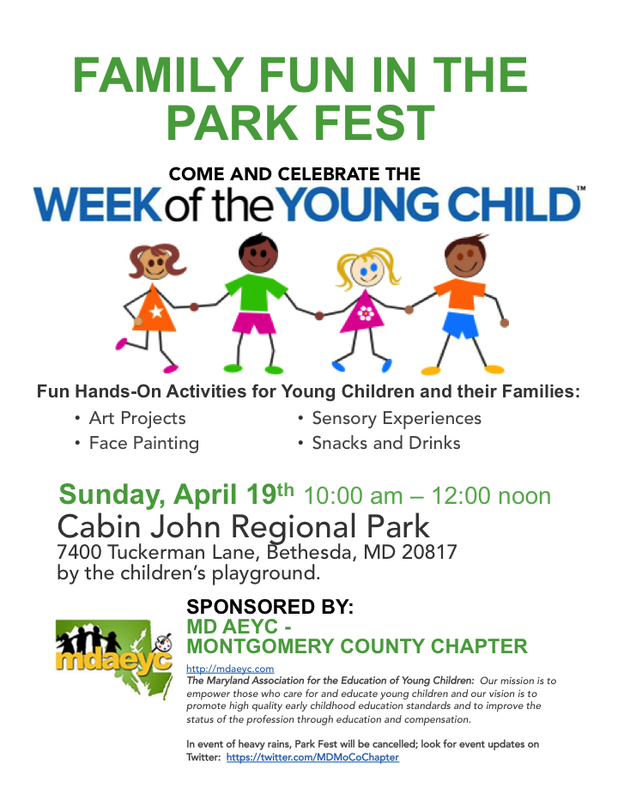 This week is the Week of the Young Child, and in Maryland, the MDAEYC — Montgomery County Chapter is hosting a Family Fun in the Park Fest to celebrate! The Park Fest will be held at Cabin John Regional Park on Sunday, April 19th, from 10:00 am to 12:00 noon. Families with young children are invited to come out and join us for some fun hands-on activities, including sensory play experiences, craft projects, and face painting. The park is located at 7400 Tuckerman Lane, Bethesda, MD 20817. The Park Fest will be held near the playground. The Week of the Young Child runs from April 12th- 18th this year, and is an annual celebration to focus attention on the needs of young children and their families, and to recognize early childhood education programs that serve their needs. The National Association for the Education of Young Children, the world’s largest early childhood education association, hosts this celebration each year. Local communities around the nation are hosting events celebrating young children this week. MDAEYC — Montgomery County Chapter is a membership organization of early childhood education professionals who live or work in Montgomery County, Maryland. You can follow the Montgomery County Chapter on Twitter or Facebook. We hope to see you at the Park Fest on Sunday!